Posted January 12, 2013 by laurielmorrison & filed under Middle Grade Literature, Posts with specific prompts or suggestions for specific assignments, units, and books, Teaching, The Writing Process. 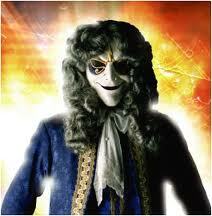 I’m working my way through the first seasons of Dr. Who, and last night I watched an episode called “The Girl in the Fireplace.” In that episode, the Doctor passes through time windows to 18th century France to protect a young woman being stalked by extremely creepy looking clockwork droids. For the Doctor, only a few minutes separate his trips to protect the young woman. But for the young woman, years pass between each of his visits. She realizes that he can jump into a page of her life, as if her days were bound together in a book, but she is stuck on the “slow path,” living out each long day in order. It’s a great episode. However, I don’t know about you, but I don’t often feel like my day-to-day life is a “slow path.” Days seem to pass especially quickly on vacation, but even during a work week, I’m amazed at how fast Friday arrives (and then I’m really amazed at how soon Sunday evening comes). It’s hard to believe that the school year is almost halfway over! Even though time seems to pass so quickly, I don’t like to rush my classes through assignments. For writing assignments, especially, students often do best when we move along fairly slowly, spending time on each stage of the writing process. And when we’re reading books as a class, I don’t want to assign too many pages of reading every night because my students are so busy, and reading carefully can take a long time for many of them. If I give them too much reading, it’s as if I’m encouraging them—forcing them, even—to have to skim. But I also think it’s important to vary the pace. If we spend too long on each unit, English class might begin to feel like a long, slow path indeed. In both seventh and eighth grade, the couple of weeks between winter break and the end of the second quarter felt like a good time to do something different and creative in a short mini-unit. I can’t actually take credit for coming up with the eighth grade mini-unit, because a student gave me the idea. 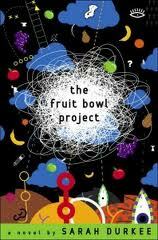 She lent me a copy of Sarah Durkee’s novel The Fruitbowl Project and suggested that it would be fun to try out our own version of the project together. The first part of The Fruitbowl Project introduces an eighth grade writing class in New York City. Their English teacher invites her cousin’s husband, a rock star, to visit the class and talk about how he writes songs. He offers an analogy: a song (or any piece of writing) is like a bowl of fruit an artist might paint. The bowl of fruit is a stable, definite thing that the artist wants to represent, but the artist can use all different colors and techniques to depict it. Similarly, writers start with a basic story and play around with point of view, genre, and style, and can tell that story in an infinite number of ways. In the first part of The Fruitbowl Project, the class comes up with a basic story, about a boy who drops his pencil during a reading test and bumps a girl’s elbow. The second part, then, is an anthology of the students’ versions of this story. The anthology includes the boy’s perspective, the girl’s perspective, the teacher’s perspective, a limerick, a sonnet, a rap, a screenplay, a fairy tale, a preschooler’s version, a newspaper article, and a whole lot more. I shared excerpts of The Fruitbowl Project with my eighth grade students, and then together we came up with our own basic story, which involves two shopping carts colliding in the toy aisle at Target. For the next few days, eighth graders will be writing their own versions of the story we’ve created. They’ll be writing from all different perspectives (including that of the baby in one of the shopping carts and a toy inside the other) and in all different genres (including text messages back and forth between two characters and a cross-examination). For the seventh grade mini-unit, we read two short stories with multiple first-person narrators: “Jeremy Goldblatt is So Not Moses,” by James Howe, and “The Arf Thing,” by my good friend Val Howlett, who was generous enough to share her writing (which my students loved and deemed “funny but sad”) with us. In both stories, the narrators have very different voices and perspectives, and they’re all responding to an important event that has already happened (but that the reader doesn’t get a full explanation of until late in the story). Now, seventh grade students are writing their own stories with multiple first-person narrators and a revelation in the second half of the story. Because we don’t have a lot of time to work on this project and students have a lot of end-of-quarter work in all of their classes, I’ve put students into groups of three or four instead of having them write their stories individually. Groups have enthusiastically come up with a story idea, narrators, and an outline together, and then each student is writing two or three narrators’ short sections. They’ll compile their sections together next week. One nice thing about this project is that I get the benefits of group work (students’ enthusiasm, less work for each student, and less volume to grade during crunch time for me), but I can still evaluate students on their individual work. (As someone who wasn’t all that crazy about group work when I was a student, I always like to make sure that students are held accountable for their own contributions.) There are logistical issues, of course, because some kids have been sick, but so far the benefits of the group assignment have outweighed the challenges. I’d love to hear about any short, energizing assignments other teachers out there like…or short, energizing projects you writers use when you need a break from the long, slow path of a longer endeavor. Happy 2013!